Running Form | Blackhill Bounders Running Club. Having proper form when running is essential in your performance. It can help you run faster with less stress on the body, and reduces the risk of injury. 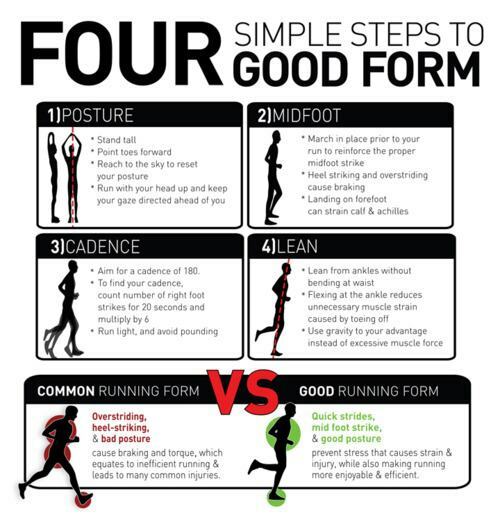 Many runners think that running form is only important for competitive athletes. That assumption is wrong. In many ways it is even more important for a beginning runner to learn proper form. Learn it early and you will avoid picking up bad running habits that can cause you to become injured, frustrated and an inefficient runner. As you run, keep your arms and hands as relaxed as possible. Gently cup your hands, don’t clench your fists because it can lead to tightness in the arms, shoulders, and neck. By keeping your upper body aligned, steady and relaxed, energy is conserved and refocused to where you need it in the lower half. Run tall with your back straight and your shoulders relaxed. Imagine a helium balloon attached to your head as you run. Your arms should swing mostly forward and back, not across your body, between waist and lower-chest level. Keep the angle of your elbows at 90 degrees, and be sure not to release that angle in the back swing, as it will only waste precious energy. Having too long of a stride, or “over striding,” is a huge cause of both hamstring and knee injuries. This is when you land with your feet in front of you instead of under you. Not bending your knees when you run will create stiffness and poor circulation in your legs. A heel first foot plant also means you are over striding. landing on the heel acts as a brake. The most efficient foot plant is one in which your foot lands directly under your hips or your centre of gravity. See pic below for example of a non heel striker and a heel striker. Create a straight line from the crown of your head to your feet. When you’re properly aligned, your body is supported by your structure, not your muscles. Leaning slightly from the ankles allows gravity to pull you along as you fall forward. Land with a mid-foot strike rather than a heel strike to decrease impact to your lower legs, knees, and hips. Keep your stride short to avoid pulling yourself forward with your legs. As your legs swing out behind you, allow your hips to rotate around their central axis with each step. Make sure your core is engaged and that your pelvis isn’t moving laterally (side to side). Maintaining a constant cadence-the rate at which your feet strike the ground measured in strides per minute-prevents your legs from spending too much time supporting your body weight with each step. We recommend running at a 170 to 180 spm (or 85 to 90 spm for each leg). Good running technique doesn’t just happen. It needs to be learned and created and worked at constantly. The best way to measure good running technique is in its efficiency. An efficient runner will do much less work over a given distance than an inefficient runner.